Fieldwork has long been a defining effort of the Vernacular Architecture Forum. Among the many and various research methods employed to understand buildings and landscapes, this one has been preeminent for many of our members, and figures prominently in our programs and our publications. Not all VAF members make fieldwork the focus of their research and practice. But all of us recognize fieldwork as one of VAF’s distinguishing endeavors. 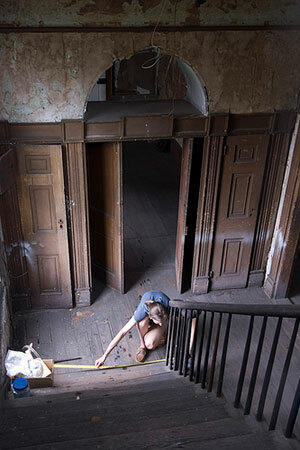 Ask someone to conjure up a VAF member in action, and you are likely to get a description of someone crawling around in a dirty old building with flashlight and tape. Whether examining the oldest house in town, or the most tumbled down, many VAF members are happiest in the field working out details of construction and phasing in systematic and archaeological assessments of building fabric. This evidence, presented in scaled drawings, has helped members of the VAF to transform our understanding of buildings and landscapes. But this is not the only fieldwork undertaken by members of the VAF. For many, the focus is not on individual buildings, the farmstead or ranch or even the hamlet, but rather on larger aggregations of buildings, clustered in villages, stretching across large expanses of the countryside, crowded into city and suburban neighborhoods. Traversing these landscapes, camera in hand, VAF members are alert to the importance of considering buildings in context, and regularly engage streetscapes as well as details of finish, settlement patterns as well as plans. For others, fieldwork to understand the built environment also stretches beyond a consideration of the artifact itself, as researchers take oral histories, record gatherings, and film festivals. All of this work is fieldwork, and together with the multitude of other resources available to the student of the cultural landscape and its complex components, this variety contributes to the interdisciplinary and multidisciplinary character of the best scholarship in vernacular architecture. However one pursues fieldwork, our efforts are grounded in the belief that images, objects, buildings, and landscapes are critical evidence in our search for an understandable past. VAF’s commitment to fieldwork is reflected in the programs, grants, and awards that focus on this type of research. This is the work that precedes our annual meetings and provides us with the informative guide books that illuminate our signature field tours. The fruits of these efforts can be sampled at our annual conference’s paper sessions and fill our newsletter and our journal. Fieldwork occupies a significant portion of Invitation to Vernacular Architecture, by Thomas Carter and Elizabeth Cromley, where several field methods are described. To encourage this work, VAF provides funding for fieldwork preceding the annual meeting, and for students of all ages to attend field schools and work through Ridout Fieldwork Fellowships.